First of all, apologies for not putting this up last week, but the weekend and real life commitments called. Besides, you didn't need me to tell you that the data last week stunk, right? The Refinance Index increased 9.2 percent from the previous week and is the highest Refinance Index observed in the survey since the week ending May 15, 2009. The seasonally adjusted Purchase Index decreased 2.0 percent from one week earlier. 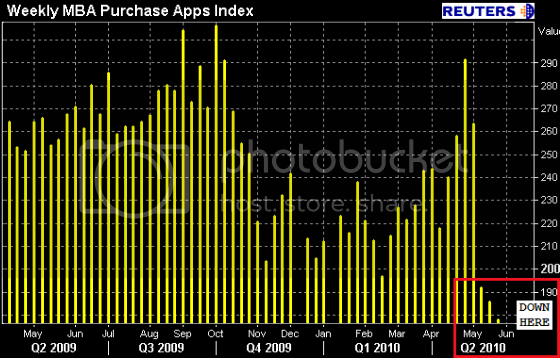 The Purchase Index has decreased eight of the last nine weeks. The unadjusted Purchase Index decreased 2.3 percent compared with the previous week and was 34.7 percent lower than the same week one year ago. While the refinancing news is a definite silver lining, it seems nowhere enough to offset the running-into-brick-wall thud of the origination market. New auto sales declined in June to 11.1 million vehicles on an annualized basis. After rebounding strongly late last year, auto sales have stagnated in the last 4 months. I suspect this is Oil price related, but that explanation is for another post. rose 3.9% in the July 3 week vs. a year earlier, fueled by pre-July 4 buys and hot temps, the Int'l Council of Shopping Centers said. June comps likely rose at the high end of a 3%-4% target, ICSC said. For the month of June there was a gain of 3.0%. Meanwhile, Shoppertrak reported sales for the week ending June 26 rose a strong 6.3% YoY, while down 8.0% from the prior week. Gas held stead at $2.73. The 4 week average of usage is up substantially from last year up 2%-4% YoY in the last couple of weeks, the first time since early this year that this has happened -- showing consumers remain very responsive to price changes at the pump. The BLS reported 454,000 new jobless claims this week. In the next 3 weeks, we may finally break out of the range these have been in since the beginning of the year -- but if so the reason is most likely that GM in particular is keeping its auto plants open in July, so typical seasonal layoffs aren't happening. (On that score, the hot new Cadillac CTS Coupe has begun to hit the showrooms this week, so be sure to stop in and drool). Railfax showed an improvement in cyclical and intermodal loads this week, inching forward compared with last year. Baseline traffic remained worrisomely stuck at last year's levels. Weekly M1 and M2 were reported up 1% and up 0.2% respectively. On a month over month basis they are up 1% and 0.5% respectively. This will be a mild positive for the June LEI, which will still probably be very negative due to housing permits, manufacturing hours, and the stock market. Real M1 and M2 remain up about 4% and 0.8% YoY, respectively. 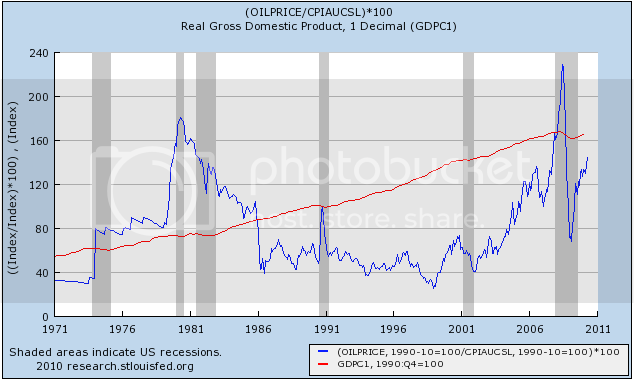 There was never been a recession since 1920 with a positive real M1. U.S. staffing employment is 32% higher than the level reported for the first week of the current year and is 26% higher than the same weekly period in 2009. There is good news and bad news as to the Daily Treasury Statement. June concluded with 8% grains compared to 2009, the best comparison of any month in 2 years: $144.4 Billion s vs. $133.5 billion in June 2009. July started out with a bit of a thud, and 4 days in is running slightly behind last year, $33.0 B to $34.7 B. For the last 20 reporting days, however, we are still up a solid 5.5%, $128.4 B vs. $121.8 B. In general, coincident indicators continue to show strength, but leading indicators -- especially purchase mortgage applications, which are the most important metric of all right now-- are of real concern. 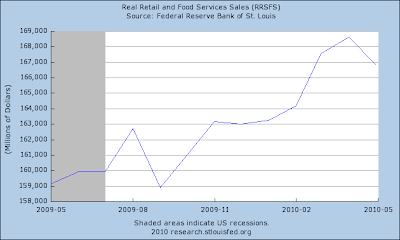 Watch for retail sales this coming week, especially ex-gasoline. Whatever rise there was in retail sales (if any), it has come too late to matter given the current enormous mess in state budgets. Moreover, please note that states are still hugely in trouble after siphoning off huge tax increases. I may even agree with the second paragraph, but notice that he finally had to do (some of) his homework, and this point is far more qualified than his original, incorrect point. 1. He cites an article from July 2009 w/r/t tax increases in many states that rose earlier in 2009. Any of those increases already in effect in May 2009 are equally applicable to both years and support the data I cited. 2. He cites a California article that references the many tax increases that took place beginning in April 2009. Again these are applicable to both years and so support my point. 3. He cites an increase in New York City taxes. This is irrelevant to State revenues. Only his argument about Texas appears to hold water, and Texas has been the laggard throughout (what's up with Jersey, though?). BTW, thanks to all commenters. I may not always reply (there's that life thing), but I always appreciate your input. While 3-month Libor's rise has stopped, it is still too high and indicates banks are concerned about liquidity issues. China's foreign-exchange agency sought to ease concerns about how it uses its huge currency reserves, saying it operates on market principles and would never wield its holdings of U.S. government debt as a threat. The statement Wednesday by the State Administration of Foreign Exchange was the latest in a series of moves by the agency aimed at addressing concerns about its influence. Presented in question-and-answer form, the statement, posted on the agency's website, rebutted what it portrayed as misconceptions about its management of China's $2.4 trillion in foreign-exchange reserves, the world's largest. The statement rejected the notion posited by some analysts and American politicians that China's large holdings of U.S. debt constitute a "threat" to the U.S. The agency said the market for U.S. sovereign debt remains an important one for China's reserves, due to its security, liquidity, large capacity and low transaction costs. The sovereign debt of some other countries may not be issued in sufficient quantities to meet China's needs, the agency said, without naming countries. The foreign-exchange administration's investment actions are frequently the subject of speculation that sometimes affects global markets. While it long refused to comment on such issues, the agency has become somewhat more forthcoming over the last year since its U.S.-educated chief, Yi Gang, took the helm. 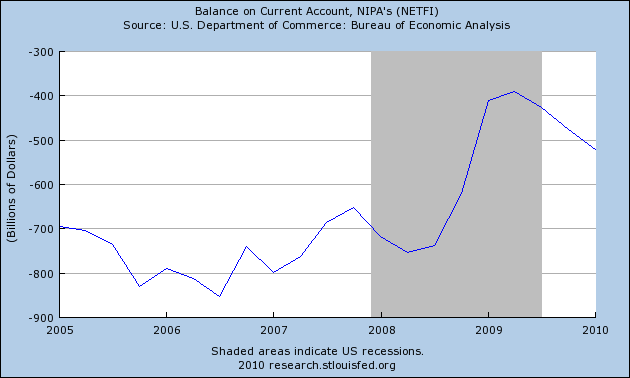 Then we learn the US will not label China a currency manipulator (wink, wink -- nudge, nudge). The US declined to name China as a currency manipulator in a politically sensitive report on Thursday, citing Beijing’s loosening of the renminbi peg in June as “a significant development”. The report had been delayed from April as part of a process of quiet diplomacy to encourage China to allow some flexibility in the exchange rate. The inter-government phones have been busy. Let's start with the equity markets. Yesterday, prices gapped higher at the open (a), but fell into a tight trading range for most of the day (b). Note how the MACD gave very neutral readings for most of the day (e). There was a late day rally (c) on higher volume (d), indicating that traders were willing to hold positions overnight. On the daily chart, notice how the downward candles (a and b) have larger volumes than the rallies (c). In the agricultural markets, notice that prices had a strong advance (a), followed by a sell-off (b) followed by a stronger advance (c) that crossed over important resistance (d). Ag prices continue to move higher, moving through key resistance. Also note the EMA picture is still developing in a positive manner. The euro -- the sell-off that started the current correction -- is rebounding. Notice the EMA picture (the 10 and 20 day EMAs) is rebounding and the 50 day EMA is neutral. But, the A/D and CMF lines are still bearish (d and e), indicating we're not seeing a big move into this area of the market yet. Although industrial metals have broken through resistance, they are now in a trading range between 17.60-17.80 and 18.80-19.00. However, notice that we're not seeing a big volume move into this market yet, as the A/D and CMF lines are still very negative. 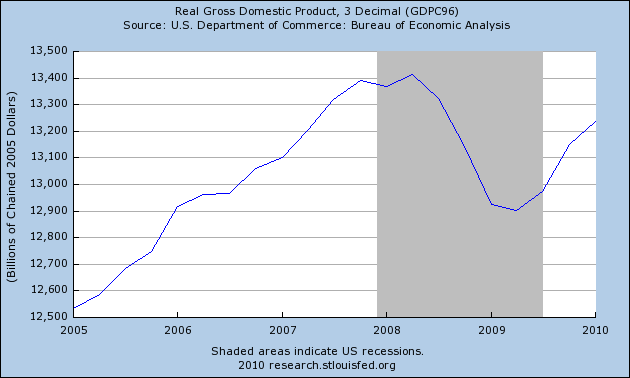 There has been a tremendous amount of talk lately about a double dip recession. According to some, it is just a matter of time. 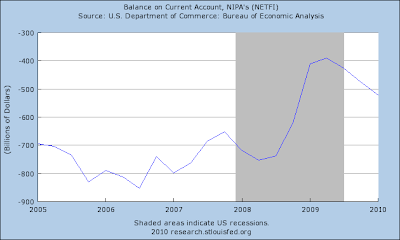 The idea has even been floated that the recession never ended. Let's look at the underlying data to examine the overall economic situation in the US in order to examine the validity of these arguments. 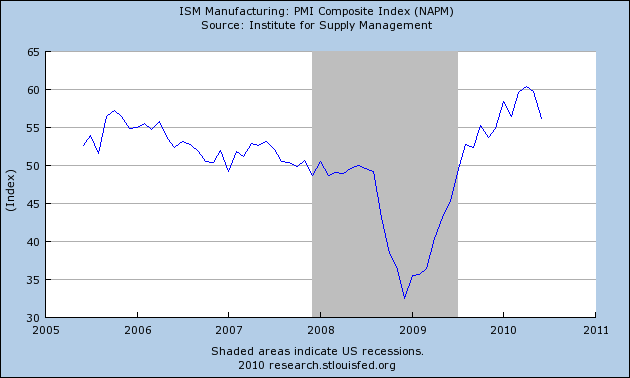 The manufacturing number has been in a clear uptrend for nearly a year and a half. It has been printing about 50 (indicating an expansion) for nearly a year. 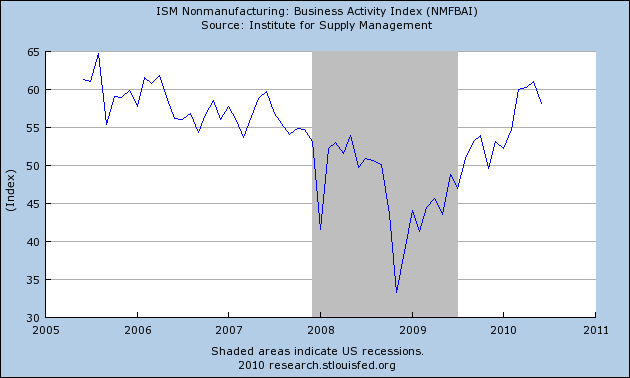 Like the ISM manufacturing index, the ISM services index has been increasing since the end of 2008 . It has been printing above 50 for nearly a year. So -- both sides of the economy are in expansion mode, and have been for awhile. In addition, they're not "just over the line." Both are printing strong numbers. 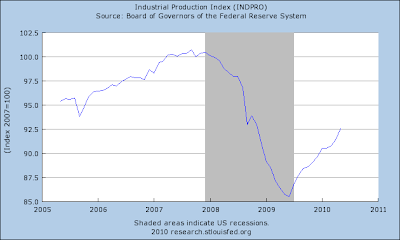 Regarding manufacturing, how is industrial production? 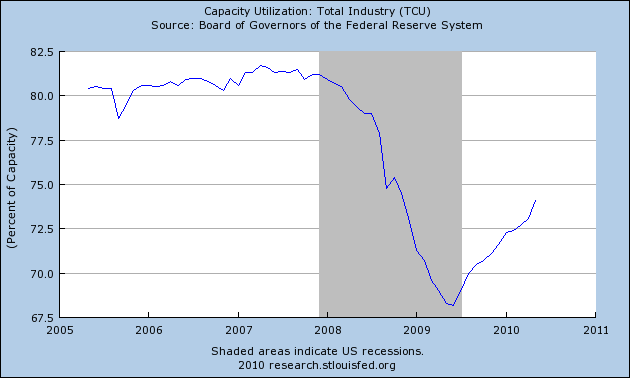 Capacity utilization has been increasing since a little before that time. However, this number is still below the lows of the previous expansion, indicating we have a long way to go. In other words, the US industrial capacity is increasing/expanding and the economy is making up as much ground as realistically possible. 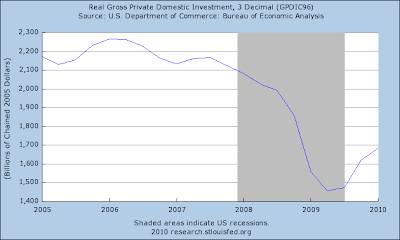 So, why don't we break GDP down into its components? 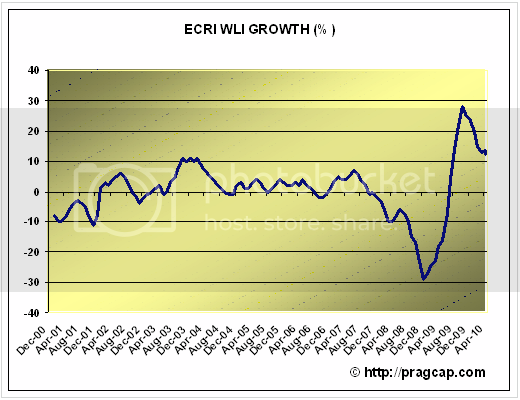 Real PCEs have been in an uptrend for nearly a year. They are now higher than their 2008 peak. 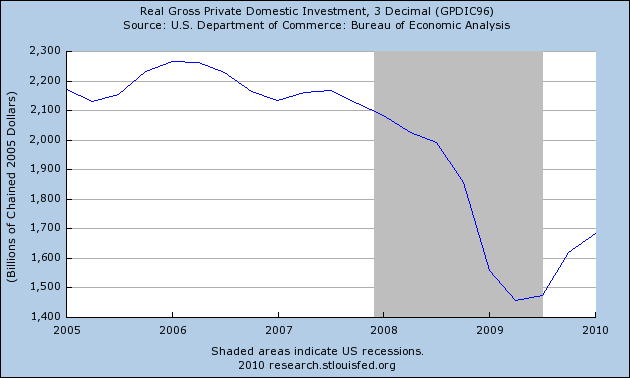 Gross private domestic investment has been increasing for three quarters. Real exports of goods and services are increasing. Which has been growing for the last three quarters. 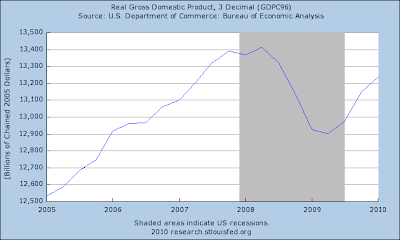 The preceding graphs illustrate a very important point: overall things are much better now than they were a year ago. Many parts of the economy have seen growth and improvement. Here are the points of concern. 1.) Unemployment: job creation has been incredibly weak and the unemployment rate is still high at 9.5%. Initial jobless claims have been in the 450,000-480,000 range since the beginning of the year, indicating there is a fundamental issue with the employment market. Adding to the problems are the types of jobs lost. About 25% are construction, which won't be coming back anytime soon given the current situation in the housing market. About another 25% are manufacturing jobs, which also aren't coming back soon, largely because of increased productivity. As for the other jobs, there are four reasons why hiring has been slow: increased productivity, low capacity utilization, low hours worked and overall uncertainty. Simply put, it will take a long time for the unemployment rate to decline. The real problem here is how Washington has chosen to deal with the topic -- namely, cutting off unemployment benefits in the name of austerity. Frankly, I don't see how that can last more than a few months without all the people in Congress getting a really nasty earful from the folks back home. However, I could be wrong -- we are talking about Washington, after all. 2.) Housing: as I wrote a few weeks ago, housing faces a huge over supply issue. This will probably lead to further price declines. How much is anybody's guess. However, what should happen is an extension of the home buyer tax credit. If this doesn't happen housing will be an issue going forward.But notice that housing has not contributed positively over the last year and the economy has still expanded. 3.) China: here's the central issue. Yes, China is trying to put on the economic breaks. But they're going to slow from over 10% GDP growth to below 10% GDP growth. Even if they come in at 6%, they will still provide positive momentum going forward for their trading partners. 4.) Europe: If they really wanted to get out of the EU arrangement, this would have been the time. Instead, the EU has pledged about $1 trillion to stabilize the region's debt situation. In addition, it looks as though plans to implement the bail-out are moving forward. 5.) 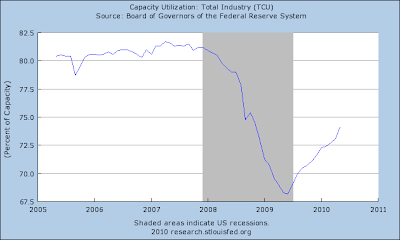 Austerity issues: this is the big wild card going forward. If the governments become too enamored with spending cuts they will essentially be cutting off their nose to spite their faces. I've highlighted the poor record of countries that have tried austerity before their economies were ready (see here and here). From my perspective the China issue will lead to slower growth but not a recession. Europe appears to have a solution to the sovereign debt issue; what matters now is implementation. But, that situation also appears to be moving in the right direction (the euro's recent move from a bottom indicates traders are gaining more confidence in the solution as well). That means the real issue is Washington -- or, more specifically, political stupidity screwing up the economy. If they do the, "we're not going to spend any more money" gambit, then we're in real trouble. Simply put, this is not the time to withdraw support and help for the economy. But, even with moderate help there is enough strength in the economy to muddle through. At the end of last August, I wrote a price titled The Fits and Starts Expansion. I used that title specifically to illustrate the type of growth we would see: one area of the economy will lead for a few months, then another would take over as the first fell back. So instead of all parts working in harmony, parts would take turns leading. As a result, we would experience slower growth, largely in the 1%-2% range. That is still the primary scenario I see going forward. It won't be pretty, but it will be growth. Finally, as I noted previously, interest rates are low and oil is cheap.Additionally , all this talk about double dip recessions has failed to highlight why the last one happened: a huge spike in interest rates by the Federal Reserve to tame inflation. There is no way the Fed is going to increase rates right now. Readers may recall that I have come to regard Mish as something of a contrary indicator. By the time he trots out a doomish statistic, it is probably very close to its turning point. In the last twelve months railroad traffic, home-price adjusted CPI, and finally state tax receipts all fit this pattern. 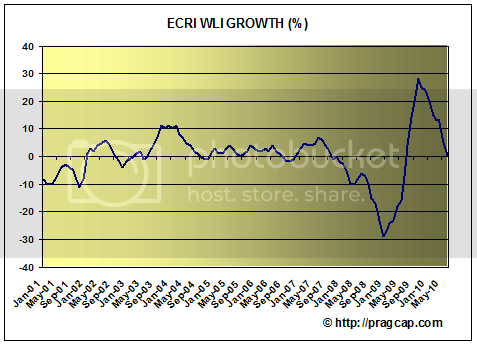 Month in and month out we hear the same nonsense about retail sales. I will believe it when I see state sales tax collections support the claims. Reis has it correct and so do I. Not only is it easy to beat record low comparisons of a year ago, same store sales are rising in part because stores are closing like mad. More importantly, states have been reporting declining sales tax collections for the entire year. Admittedly state tax collection numbers are frequently delayed by a couple months, but that still does not jibe with overly bullish comments about sales over the first five months of the year from the International Council of Shopping Centers. Of all the states he reported on in February, only New Jersey reported a decrease in YoY sales tax revenues, down -3.3%. With one exception, the others weren't just up, but up well in excess of the inflation rate. In short, they supported the bullish Census Bureau report. Mish's own yardstick cuts the legs out from under his argument. In a way, it's sad. 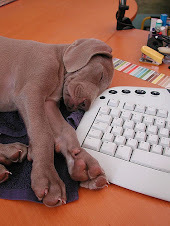 When we wants to, he can do some prodigious analysis. But he has been so blinded by his Austrian/libertarian/goldbug ideology, that instead of fitting his conclusions to the data, he tries to fit the data into his preconceived conclusions. 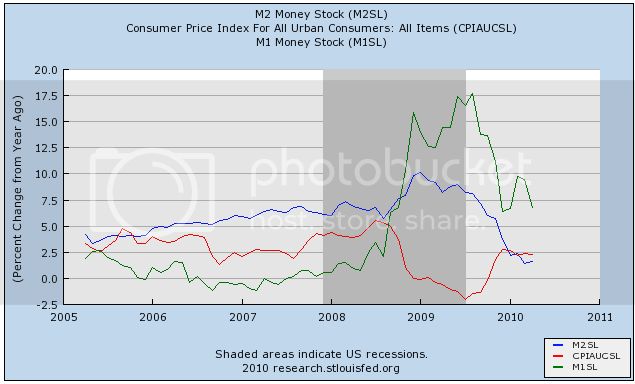 For example, about three years ago he wrote a number of posts about a money supply measure he called "M prime." He fit those into a version of Kasriel's recession indicator, and got an extremely tight fit with no false positives or negatives. With the hubbub about "double-dip" now, it would be very interesting to see what an "M prime" model showed. But Mish won't do it, because ideologically he has refused to believe the improving data that has been accumulating now for an entire year. Thus, deductively, if there's been no recovery, why examine data that would shed light on a possible double-dip? In the meantime, the Emperor of Doom is wearing no clothes. Let's start with the big news from yesterday -- the big rally in the equity markets. At the close, prices just got above key resistance. Taking a closer look at the price action, prices gapped higher at the open, rose and then consolidated in a bull market pennant pattern (b). Next prices formed a double top (c), but found support at the 20 minute EMA (d) instead of moving lower. Prices continued to move higher, and eventually moved through key resistance before the close (e). Also note the increasing volume as the day wore on (f). On the daily chart, prices rose above the 10 day EMA. Agricultural prices have caught a bid -- note the strong move yesterday (a) and the increased trading volume over the last few days (c). Also note the 10 and 20 day EMAs are about to cross the 50 day EMA -- a bullish crossover. The fundamental reason for this move is a drop in estimated crop yields coming out of Russia. The dollar continues to move lower, as prices have now moved though the 10, 20 and 50 day EMA (a). Also note the 10 day EMA has crossed below the 50 day EMA and the 20 day EMA is about to do so as well. The daily chart shows some pretty big price moves. Last Thursday prices gapped lower in a big way (a) crossing below important support (b). Prices have clearly been trending down since (c). U.S. retailers’ sales are growing at the fastest pace in four years, a sign consumers may be overcoming concern about unemployment and depressed home values. Sales probably expanded at an average monthly rate of 4 percent in the first five months of the retail fiscal year that began Jan. 31, the biggest gain since 2006, the International Council of Shopping Centers trade group said in advance of its June report tomorrow. Nordstrom Inc. and Kohl’s Corp. are among chains that will report June sales increases at stores open at least a year, according to analysts’ estimates. Retailers may have bucked last month’s drop in consumer confidence that threatens to temper the rebound. The year-to- date growth in sales shows that spending, a key driver of the U.S. economy, is faring better than many investors are betting, said Michael Niemira, the New York-based ICSC’s chief economist. Consider this news with the following charts from the St. Louis Fed. 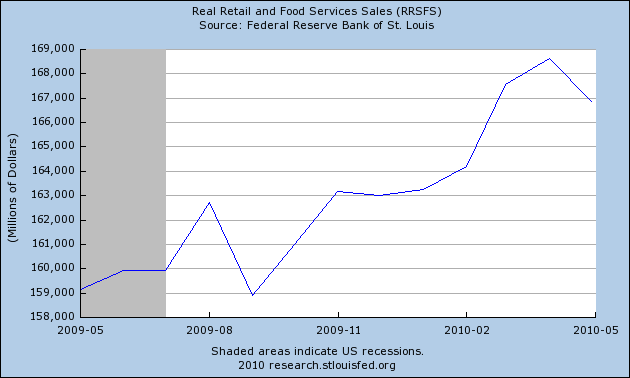 As stated in the above story excerpt, real retail sales have been uneven. However, the general trend is upward. 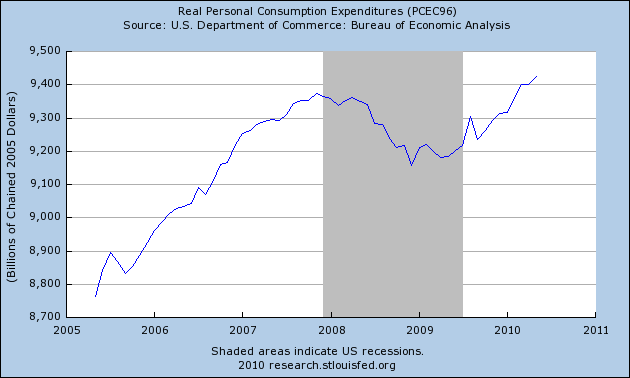 A larger data set -- personal consumption expenditures or PCEs -- have clearly been in an uptrend for the last year. Back in 2006 and 2007, when Bonddad used to hang out at a big political blog, I would poke (lighthearted) fun at a few of his posts with something called the "Bonddad Put." The Bonddad Put came into play when the market had sold off 3% or 4% or some other horrendous figure in one day after a downward draft. People would think it was The Big One, and inevitably he would write a top-rated diary entitled something like "A Special Note from Bonddad about the Market." After a couple of those, I noticed that they were almost perfect markers for a bottom in market sentiment. The Bonddad Put meant it was a sure thing that the market would trade higher for the next 30-45 days -- and it worked! By the time The Big One actually hit in September-October 2008, plunges were common enough that Bonddad no longer inevitably wrote those posts, and so the Bonddad Put never came into play. Something like that old Put looks like it is in play now. Last Saturday's Barron's weekly financial magazine revealed that investor sentiment is very bearish, with the AAII Index showing bullish sentiiment down to 24.7%, and bearish sentiment at 42.0%. The Market Vane Index similarly showed bullish sentiment down to 40%. Although I haven't been able to locate it online at the Barron's data page, if you check mutual fund cash flows, you will see that retail investors redeemed about $25 billion worth of equity fund shares in June. The blue line is my addition, noting how low the ratio of insider transactions had to go for there to be a short-term bottom. Note also that there were several of these in the few months just before The Big One -- so following insider trading would not have kept you out when it hit, unless you sold 30 days after the Put was triggered. For what it's worth, I suspect insiders are more savvy now about deflationary signs of economic downdrafts than they were in 2008. Of course, the usual caveats apply. I'm not offering investment advice, and I care a lot more about how the market reflects on the real economy than about short term trading. But to me, the odds are that the market is offering up one of those rare low hanging fastballs over the center of the plate . Shorter version: it looks like we are a lot closer to a bottom than a top. Besides posting here, Bonddad and I not infrequently have phone conversations about the markets and economy (I know, you're shocked). Over the weekend, I noted that almost all of the data started to head south at precisely the same time -- late April. Commodities, stocks, bond yields (more on that below), mortgage applications, the index of leading economic indicators, YoY CPI -- all appeared to stall or began to decline at almost the exact same time. Unless we are to believe that we will have blazing growth for the next few months and then hit a wall, an index that plummets that fast in 45 days has a problem. Of course, I should qualify that by noting that the we did actually have non-census job growth in both May and June, and real income has been increasing, as has industrial production. So the coincident incidators are still going up. It is really all of the short leading indicators (I include real retail sales in that group) that seemed to simultaneiously roll over. Because we are living in the first deflationary environment in 70 years, we have no idea how most data series perform. 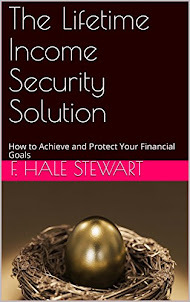 There is monthly data from the Roaring Twenties and the Depression Era in a few areas: commodity prices, bond yields, and money supply for example; but the rest was kept on an annual basis if it was collected at all, which is not much help for forecasting or policy analysis. Back when I looked at that data almost two years ago, I did find some trustworthy indicators, but they were frequently coincident or just slightly leading (mainly money supply). I also found comparing YoY commodity vs. consumer changes in prices of some help. In any event, here are the series I found that rolled over before April, and so are worthy of watching more. 1. 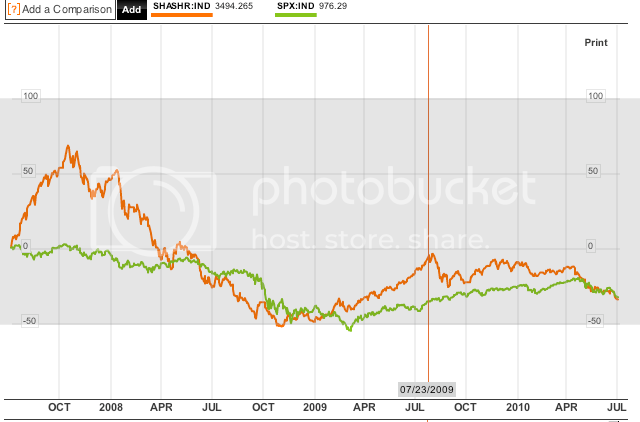 The Shanghai stock index. There is simply no question that during that time, Shanghai has been the leader. And it is not comforting that it has not turned back up. During the disinflationary 1980s and 1990s, bond yields and stock prices moved in opposite directions. That changed beginning in 1998, and generally speaking, continues now. Bond yields and stock prices have generally moved in the same direction, signalling the pre-eminence of DEflation as a concern. During the 2003-2007 expansion, within that range they did move as mirror images, however. They resumed moving in lockstep shortly before the December 2007 downturn, before resuming mirror image movements in the latter part of 2009. 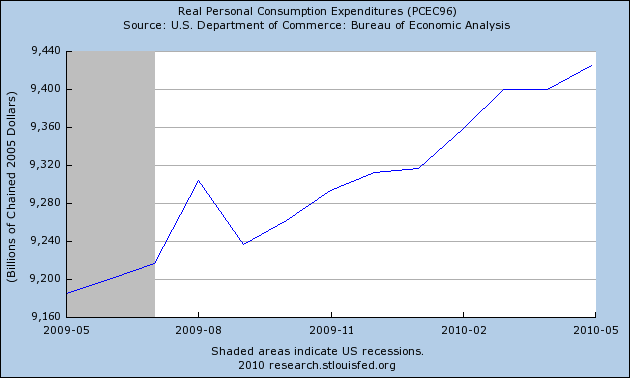 Real spending growth in that environment can only happen by tapping savings, and after 2008, that was going to be very limited. This is a modern confirmation of the trend I noted above about commodity prices and consumer inflation from the Roaring Twenties and Great Depression era. 4. 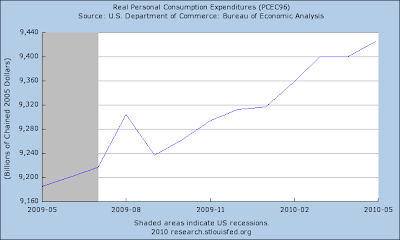 Oil prices approached 4% of GDP and 6% of consumer spending. They just grazed the 4% threshold of GDP/6% threshold of consumer spending in April. While Oil prices themselves peaked in April along with nearly everything else, it appeared obvious in January that they would trigger a slowdown or reversal sometime this year. 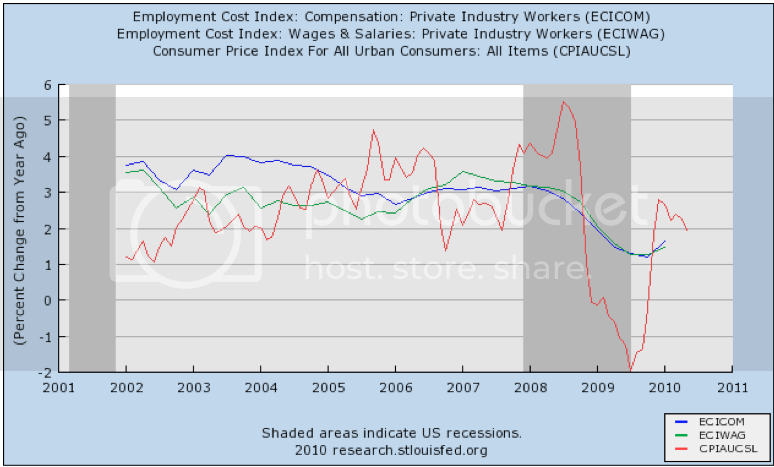 The M2 decline was the chief reason for the tailing off of increases in the index of Leading Economic Indicators. Recessions have typically been accompanied by real M2 growth of less than 2.5%, and real M1 declining. We have the first, which may be turning around now. The second has not occurred. Similarly, housing permits peaked in December and again in March. Housing permits have been the second biggest source of the tailing off of the advance in the LEI, and most likely the MBA purchase mortgage index has been the primary source of the steep and sudden decline in ECRI's index. Housing is a classic "long" leading indicator, and on an annual basis, did lead the 1929 decline by several years, and bottom in 1933. That's my list. These 6 items have shown that they bear further watching (and generally I do in my "Weekly Indicators" wrap-up). If anybody knows of anything else, feel free to add it to the list in Comments. Let's start with the euro. Remember the chain reaction that sent the markets lower: the euro dropped leading to a rise in the dollar. This lowered commodity and stock prices and led to an increase in bonds. The dollar has dropped in a nearly identical pattern (note the similar a, b and c situations). As a result of the dollar's drop we've seen some movement in several commodity groups. Agricultural commodities broke through resistance (a) and rose into a downward sloping consolidation (b). Industrial metals broke through resistance (a) but have been moving sideways. Gold has dropped in a big way. Notice how prices have moved lower since moving through point (a). The long end of the curve (20+ years) remains above highs set over the last year (see points a and b). The report was issued today by Anthony Nieves, C.P.M., CFPM, chair of the Institute for Supply Management™ Non-Manufacturing Business Survey Committee; and senior vice president — supply management for Hilton Worldwide. "The NMI (Non-Manufacturing Index) registered 53.8 percent in June, 1.6 percentage points lower than the 55.4 percent registered in May, indicating continued growth in the non-manufacturing sector, but at a slightly slower rate. The Non-Manufacturing Business Activity Index decreased 3 percentage points to 58.1 percent, reflecting growth for the seventh consecutive month. The New Orders Index decreased 2.7 percentage points to 54.4 percent, and the Employment Index decreased 0.7 percentage point to 49.7 percent, reflecting contraction after one month of growth. The Prices Index decreased 6.8 percentage points to 53.8 percent in June, indicating that prices are still increasing but at a slower rate than in May. According to the NMI, 15 non-manufacturing industries reported growth in June. Respondents' comments are mostly positive about business conditions; however, there is concern about the effect of employment on the economic recovery." The 15 industries reporting growth in June based on the NMI composite index — listed in order — are: Real Estate, Rental & Leasing; Arts, Entertainment & Recreation; Agriculture, Forestry, Fishing & Hunting; Information; Mining; Accommodation & Food Services; Transportation & Warehousing; Wholesale Trade; Management of Companies & Support Services; Public Administration; Construction; Utilities; Health Care & Social Assistance; Retail Trade; and Professional, Scientific & Technical Services. The two industries reporting contraction in June are: Other Services and Finance & Insurance. While the index dropped, it is still printing above 50 indicating an expansion. A Great piece of research from the Cleveland Fed on yield curves and recessions. 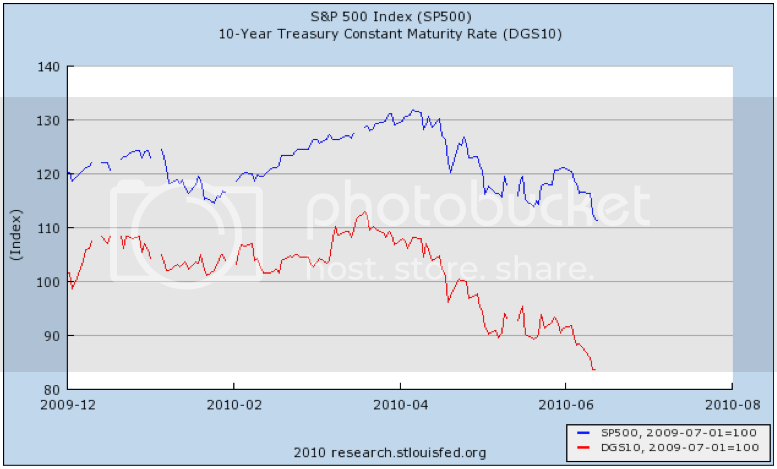 Since last month, the yield curve has dropped slightly, with both long and short rates ticking down. The difference between these rates, the slope of the yield curve, has achieved some notoriety as a simple forecaster of economic growth. The rule of thumb is that an inverted yield curve (short rates above long rates) indicates a recession in about a year, and yield curve inversions have preceded each of the last seven recessions (as defined by the NBER). 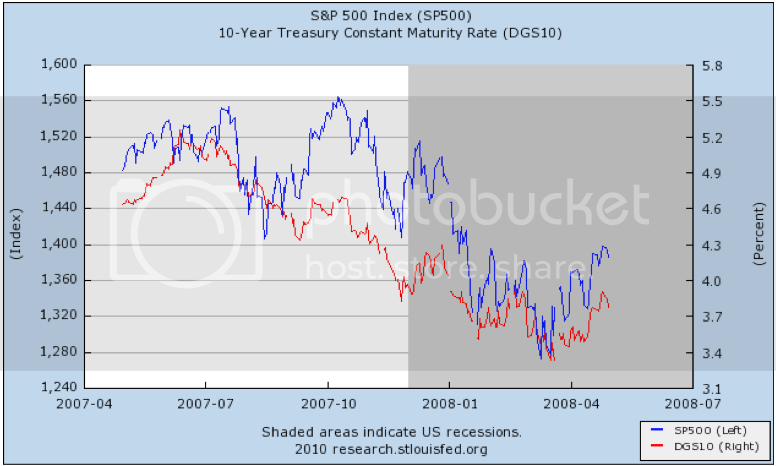 In particular, the yield curve inverted in August 2006, a bit more than a year before the current recession started in December 2007. There have been two notable false positives: an inversion in late 1966 and a very flat curve in late 1998. More generally, a flat curve indicates weak growth, and conversely, a steep curve indicates strong growth. One measure of slope, the spread between ten-year Treasury bonds and three-month Treasury bills, bears out this relation, particularly when real GDP growth is lagged a year to line up growth with the spread that predicts it. The US economy was progressing nicely until (roughly) the end of May. 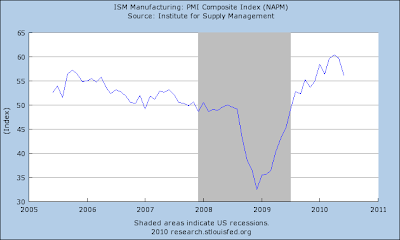 Real PCEs had been increasing for about a year, business investment was picking up, inventories were being restocked and the ISM manufacturing and non-manufacturing indexes were at strong levels.Then things turned from a progressing recovery to the appearance of a significant slowdown very quickly. One of the primary causes of this situation is developments in China -- specifically its interest rate policy as it developed through out the first part of the year. China’s “real worry” is asset bubbles as capital flows into an economy awash with money and the nation emerges from the crisis into a “boom time,” central bank adviser Fan Gang said. The central bank has this year guided bill yields higher at auctions and ordered lenders to set aside a larger proportion of deposits as reserves. The banking regulator has specified a lower target for credit growth in 2010 and Premier Wen Jiabao has also pledged to counter excessive property-price increases. China’s government, seeking to stem property speculation, told banks to raise interest rates on third mortgages and demand bigger down payments for such loans, a person with knowledge of the matter said. The China Banking Regulatory Commission warned lenders of the risks associated with “hot money” flowing into the property market, the person said, requesting anonymity because the agency hasn’t published the measures. Mortgage defaults in China are rising, the person said without giving figures. The People’s Bank of China is concerned about rising global commodity prices, central bank deputy governor Su Ning said today while attending a parliamentary meeting in Beijing. The People’s Bank of China will keep a moderately loose monetary policy and “reasonably sufficient” liquidity, according to a statement from the central bank distributed before a press briefing in Beijing today. The bank will promote steady monetary and loan growth while strictly controlling loans for new projects. Inflation expectations are rising in China, making it more difficult for Premier Wen Jiabao to meet his 3 percent full-year price target and adding to the case for an interest-rate increase. The number of Chinese households expecting prices to gain in the next three months increased in a quarterly survey conducted in February, the central bank said on its Web site today, citing seasonally adjusted data. It didn’t give numbers. Chinese officials assessing when to end stimulus measures are balancing asset-bubble and inflation risks against concern that a “double dip” global slump remains possible. The world is counting on China to be an engine of growth as unemployment restrains the recovery in the U.S. and Europe grapples with the Greek debt crisis. China’s surging property market is having its “last madness” and speculators can’t fight a government resolute about curbing asset-price inflation, central bank adviser Li Daokui said. Investors “don’t realize how strong and resolute the political will is among top leaders to curb price gains,” Li said in an interview broadcast by the state-run Central Television yesterday. Property prices surged 11.7 percent in March from a year earlier, the most since records began in 2005, government data showed this week. The State Council yesterday raised mortgage rates and down-payment ratios for second homes to cool the market and damp inflation expectations as the world’s third- biggest economy accelerates. China’s third increase of bank reserve ratios this year left benchmark interest rates and the yuan’s peg to the dollar unchanged, risking the need for more concerted effort to contain property prices and inflation in coming months. The requirement will increase 50 basis points effective May 10, the People’s Bank of China said on its Web site yesterday. The current level is 16.5 percent for the biggest banks and 14.5 percent for smaller ones. The latest move adds to a government crackdown on property speculation after record price increases in March and came on a holiday weekend, with Chinese markets shut today. Within an hour of the central bank announcement, Finance Minister Xie Xuren said that officials remained committed to expansionary policies to cement the nation’s recovery. China is still going to grow -- they're simply trying to do it at a slower pace. Simply put, China's central bank is looking at a slowdown scenario. As a result, expect anyone that deals with China to slowdown. And that "anyone" category is literally every other country on the planet. Here is a chart of the FXI and the SPY. Notice how the FXIs have led for the last two years. Since the beginning of the year, the SPYs have formed a head and shoulders pattern. Prices have recently broken the neckline and are now headed lower. Note the EMA picture is turning more and more negative. Now the 10 and 20 day EMAs have moved below the 200 day EMA and the 50 is about to follow. Looking closely at the latest downturn, notice the large number of downward candles. From the peak of 113 to today's open is a drop of nearly 9%. On the 10 day chart notice that prices are in a clear downtrend. However, Prices have moved lower (a) followed by three areas of consolidation -- all at lower levels (b, c, and d). Gold is a chart that I've been watching, largely because of the technical issues. Notice that prices had a difficult time getting above the 122-123 area (a). Prices have now retreated from that area (b) and are resting on the 50 day EMA (c) for technical support. The daily chart shows the price action in a bit more detail. Notice that prices were in a range of 120-123 for about 8 days (a). Then last Thursday prices fell at the open and continued moving lower for the entire day (b). Oil has also taken a technical tumble over the last week. Notice that prices have broken key technical support (a). In addition, the 10 and 20 day EMA is clearly moving lower and the 10 has crossed below the 20 (b). Oil's daily chart shows a bit more detail of the price action. Prices gapped lower on Tuesday morning (a), consolidated for two days (b), then fell on Thursday morning (c) only to have prices consolidate again (d) for the remainder of the week. The Treasury market continues in its uptrend (a), especially after breaking key resistance levels (b).